What Should I Know about Crohn's Disease? What Does It Look Like? Why Are Nutritional Deficiencies Dangerous in Crohn's disease? What Foods Should You with a Crohn's Disease Diet? Can Eating Unhealthy or Food Allergies Cause Crohn's Disease? What Vitamins and Mineral Supplements Should You Take for Crohn's Disease? What Drugs Interact with Crohn's Medications, Vitamins, and Supplements? What Other Diet Changes Help Manage Symptoms? What Can You Do to Help Manage Chronic Diarrhea? Most of us know that good nutrition is essential to good health. Healthy eating is even more important to people whose health is compromised by a chronic disease. When you have Crohn's disease, maintaining good nutrition can be a real challenge. Several factors contribute to nutritional problems in people with Crohn's disease. 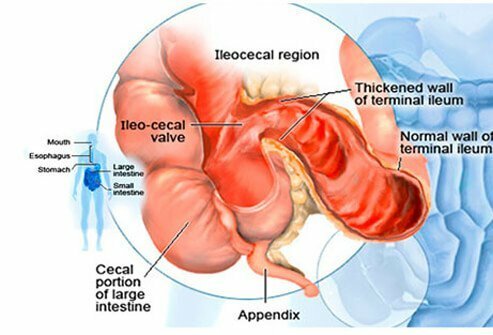 When the small intestine is inflamed, it is not able to perform its main function, which is absorbing nutrients from food. The degree of this impairment, called malabsorption, depends on the extent of inflammation and damage in the intestine. To make matters worse, the intestinal inflammation and pain of the disease reduces a person's appetite, so they probably do not eat enough to supply nutritional needs. Diarrhea further depletes important nutrients. Compounding the problem is the fact that people with a chronic illness such as Crohn's disease require more calories and certain other nutrients than healthy people. The most common nutritional problem in people with Crohn's disease is insufficient calorie intake. The human body needs proteins, fats, calories, vitamins, and minerals to grow, build new cells and tissues, and carry out its many functions. Most of these nutrients are contained in the foods we eat. To ensure that we get all of the nutrients we need, we are advised to eat a balanced diet from the four food groups: meat and other proteins, dairy products, fruits and vegetables, and cereals and grains. When we eat, foods are broken down in the stomach and intestines. Nutrients are absorbed through the wall of the small intestine, and the waste is eliminated as stool or feces when we have a bowel movement. This process is impaired in people with Crohn's disease, and nutritional deficiencies can result. Nutritional deficiencies are a problem for almost everyone with Crohn's disease, but they are most serious in children and teens who are still growing. Growth can be stunted permanently and sexual development (puberty) delayed in children and teens with Crohn's disease. Girls and women can develop hormone imbalances and stop menstruating. Nutritional deficiencies also can prevent medications from working as well as they should in healthy people. In general, nutritional deficiencies can lead to overall poor health. They can make you feel weak, tired, depressed, or just "blah." If you have enough nutritional deficiencies, it can leave you vulnerable to infections and other diseases. They can stop anyone from looking, feeling, or performing at his or her best. There is no specific diet that is recommended for everyone with Crohn's disease. However, many people with Crohn's disease can reduce their symptoms by changing their eating habits or avoiding certain foods. Foods that often cause problems are milk and other dairy products, spicy foods, fatty or fried foods, and high-fiber foods. Foods such as raw or dried fruits and vegetables, nuts, seeds, and popcorn may also worsen your symptoms. People often learn which foods they can or cannot tolerate through trial and error. If you have strictures of the small intestine, you may need to be on a low residue diet. There are many tasty foods that provide good nutrition and may not irritate your digestive tract. If you can tolerate dairy products, ice cream or milk shakes made with ice cream or yogurt are a good choice. Pizza or a cheeseburger may be a good choice. These foods are high in calories, satisfying, and taste good. However, a steady diet of high-fat, salty foods such as cheeseburgers can cause other problems such as heart disease or high blood pressure. You certainly don't need those problems on top of Crohn's disease. High-fat "junk" foods should not be daily fare. Consider them a treat once in a while if they do not exacerbate symptoms. There is no evidence that diet has anything to do with causing inflammation or Crohn's disease. No matter what you ate in the past, it probably played no part in your having Crohn's disease today. Unfortunately, though, now that you have Crohn's disease, you may find that you can no longer comfortably eat certain foods you once enjoyed. There is no evidence linking food allergies with Crohn's disease. Experts now believe that many people thought to have food allergies may actually be experiencing early symptoms of Crohn's disease, ulcerative colitis, or similar digestive diseases. Your need for vitamin and mineral supplements depends on several factors, your diet, which parts of your digestive tract are affected, and whether you have had surgery on your small intestine. The most common vitamin deficiencies are vitamins D and B-12, and the most common mineral deficiencies are iron, calcium, potassium, and magnesium. You will need to take folic acid if you are taking an immunosuppressant such as azathioprine (Azasan, Imuran) as it reduces the absorption of folic acid. Talk to your health-care professional about taking supplements. Drinking alcohol is not recommended for most people with Crohn's disease. Alcohol may irritate the lining of the intestinal wall, causing or worsening symptoms such as vomiting, diarrhea, and bleeding. It also may contribute to malabsorption, further complicating nutritional deficiencies. Alcohol interacts with many medications, causing side effects that may be serious. Finally, alcohol disrupts sleep cycles and can leave you feeling tired and irritable the next day. However, if alcohol is well tolerated and not causing any complications, it can be consumed in moderation. Chronic diarrhea can lead to dehydration very easily. Dehydration makes you feel weak, tired, light-headed, or just "blah." It can cause headaches, abdominal pain, and other symptoms. It also can place dangerous strain on your kidneys. Dehydration can be avoided by making a special effort to take in plenty of nonalcoholic fluids. You should take at least 8 full glasses of fluid every day. Try to stick to water, diluted fruit juice, sports drinks, decaffeinated beverages, and fruit and vegetable drinks. Avoid caffeinated beverages and sodas. Some medications used to treat Crohn's disease, such as sulfasalazine (Azulfidine, Azulfidine EN-tabs, Sulfazine), can interfere with absorption of nutrients from food. Certain medications taken for other medical conditions also can affect levels of vitamins and minerals in the body. Ask your health-care professional to review all of your medications. REFERENCE: Ghazi, L. J. 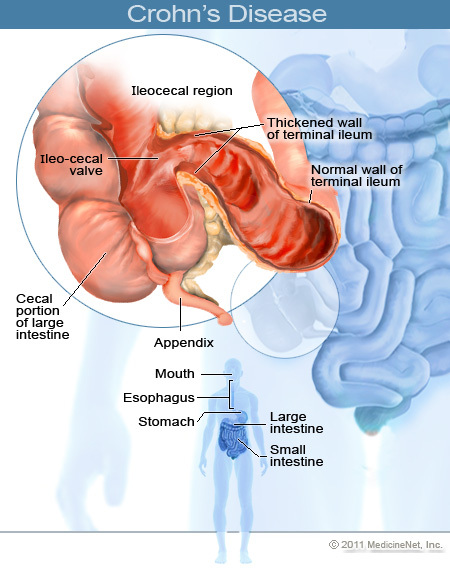 "Crohn Disease Treatment and Management." Medscape. Updated: Sep 11, 2018. Have you have problems with your medications and your diet? Please share what foods trigger your Crohn's and what foods ease and relieve symptoms? Please describe your experience with an elemental diet and Crohn's disease. What drinks have you found nutritious and helpful with Crohn's disease? Please describe what foods you have been able to tolerate, and what foods aggravate Crohn's disease. What changes have you made to your diet that have helped in managing your Crohn's diseases symptoms? Have you had difficulty getting enough nutrition with your Crohn's disease?